Ozotech Ozone Air Dryer removes humidity from the air which ensures that your ozone generator will have maximum output and extended use. Sold with reusable silica gel beads recharged by simply baking in an oven. 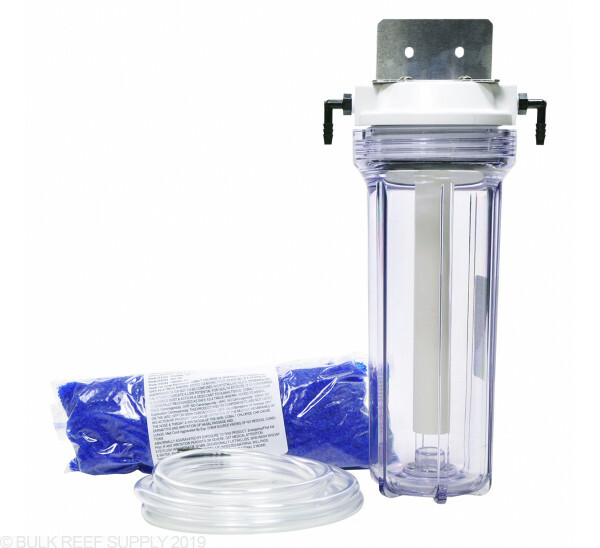 Dimensions: W 5" x H 12" x D 4"
Bulk Reef Supply strongly recommends using an Air Dryer in conjunction with an ozone generator. Works as expected. Pushes air through with an air pump, to the ozonizer. If you're running ozone more or less continuously, the amount of dessicant in this container will last less than a week. With a mature high ORP low nutrient system, it'll last much longer if, for example, you have the air pump and ozonizer on the same Apex outlet, so they turn on and off together; no unnecessary exhaustion of the dryer media if the ozonizer isn't running. Easy enough to change the media. Make sure the o-ring is clear of beads before screwing the cap back on. Requires some force and twisting to get the inner PVC pipe back down through the beads. Filling the container is easiest with a wide-mouth funnel (they sell a perfect one here.) Rejuvenation of the dessicant works great and it can be reused indefinitely. Note that the more expensive electronic air dryers require air to be pulled through them; they don't work with an air pump. Keep this in mind when considering what's best for your setup. I have a CO2 issue in my house, so I am using this to house Soda Lime for my skimmer intake and as a dryer for the ozone input as well. I like that it is well made, and comes with quite a bit of the resin. Since I only run ozone for 1/2 an hour at a time it will be quite a while before it will have to be recharged. No chance that the end will pop off and spill resin all over like a cheaper unit that I bought did. I really like it. I struggle to re-attach lid after filling, however. The tube ends up crushing some of the beads as I tighten lid. BRS suggested I turn it upside down to load. that doesn't work as the lid is mounted to the wall. Has anyone solved this issue? This is a great unit for drying incoming air for ozone. What I really like about this unit is the amount of resin that comes with it and how long it lasts. Usually you need to recharge these items daily. You can easily get a week out of this unit before recharging. I would buy for anyone with an ozone unit. I like this much better that the Red Sea air dryer i had before. No possibility of it popping open and spilling beads everywhere. 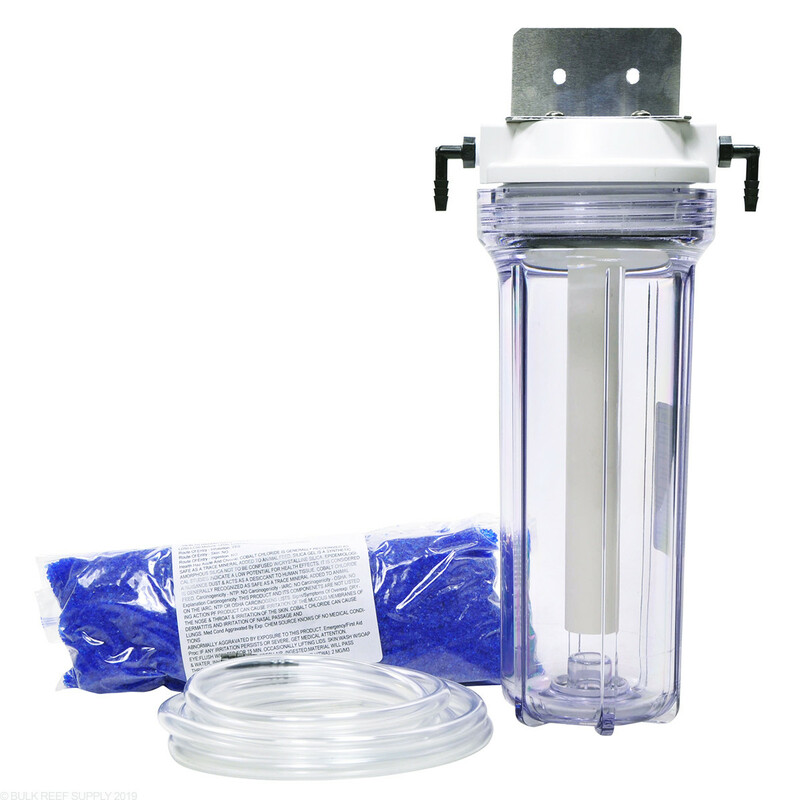 Important note on this unit is the connectors and hose included is a bit larger than standard airline hosing and will not fit aquarium air pumps. quick trip to the hardware store fixed that. If you purchase this make sure to get the right size hose.